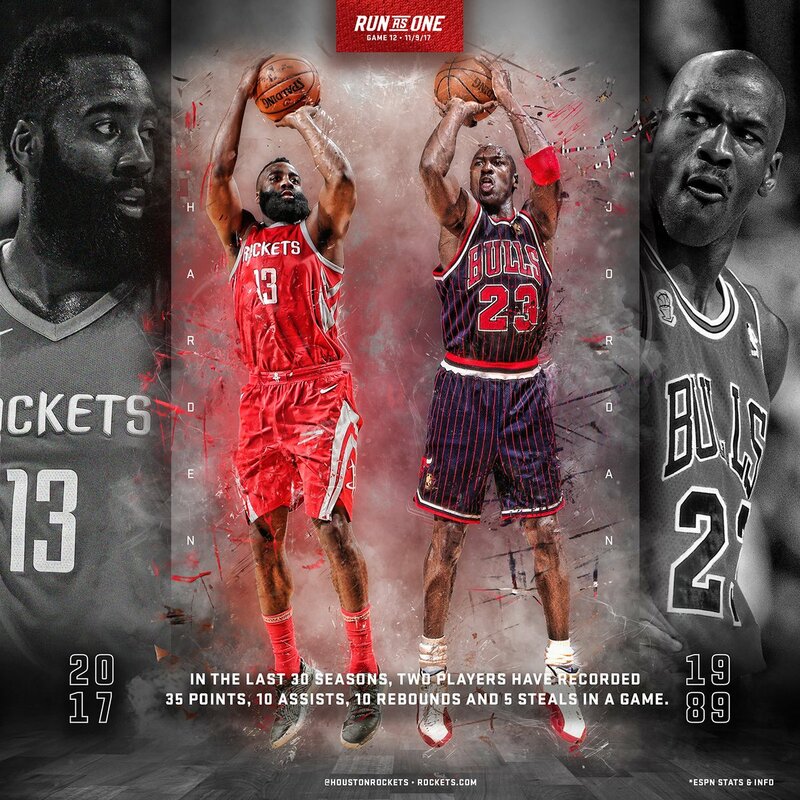 Discussion in 'Houston Rockets: Game Action & Roster Moves' started by Shaq2Yao, Nov 11, 2017. D-rock, Richie_Rich, don grahamleone and 3 others like this. Roxs-Redemption, D-rock, don grahamleone and 8 others like this. Richie_Rich, D-rock, don grahamleone and 5 others like this. He might just get his 3rd Western Conference Player of the Week of the season if he has another great game tomorrow. Richie_Rich, D-rock, don grahamleone and 4 others like this. Roxs-Redemption, Richie_Rich, D-rock and 5 others like this. Harden step back 3 point is 41 percent. We have curry and Thompson in the team. D-rock, Lawlruschang, BigMaloe and 1 other person like this. D-rock, Richie_Rich, don grahamleone and 12 others like this. Huh? Harden has plenty of of course issues if you listen to some people! However if you listen to others, he’s just living his life to the fullest. burlesk, don grahamleone, Lawlruschang and 7 others like this. The rockets have the luxury of saying the have had a top 5 all time center and shooting guard play for there franchise. Now we just need the shooting guard to win b2b championships. I really think this dude Harden is going to bring a championship within the next 3 years. I think he is the chosen one to break the divinci code that is the Golden state warriors. I love watching James Harden play basketball. He is the best player in the NBA at the moment and it's not even close. All they hype I been giving this guy has finally come true he's on another level and it will be a year or two till anyone come close imo. burlesk, Richie_Rich, D-rock and 13 others like this. I've been watching the Rockets since 93. Harden is 2nd only to Dream without question. Drexler, Barkley, Pippen, Francis, Tmac, Yao, Ellie, Thorpe, Cassell, Horry, Maxwell, and Smith aren't even close (while on Rockets). He is a truly special talent and we should all appreciate it right now while it's happening. Don't take it for granted people. In 20 years you will look back on this time period with pride and be grateful that you were there and got to witness it live. Some people are bitter and they will regret that attitude later. Don't be one of them. Realize greatness while it's here, right now. Harden is one of the best players you will see in your lifetime and he's on your team! Richie_Rich, D-rock, don grahamleone and 15 others like this. DonKnock and cmoak1982 like this. Harden with at least 6 3 pointers in 5 straight games. Richie_Rich, D-rock, dragonwill and 5 others like this. And how does OKC not start him? D-rock, don grahamleone, HakeemOnlyFan and 5 others like this. Myth: Harden's game doesn't work in the playoffs. D-rock, don grahamleone, Reeko and 2 others like this. He could win MVP this year, and next, and he'd still be criminally underrated. Roxs-Redemption, D-rock, don grahamleone and 5 others like this. The most self destructive thing we've heard about is Harden dating a Kardashian, lol. I think he is great for the team and the city. Richie_Rich, don grahamleone, Lawlruschang and 3 others like this. In the entire history of NBA, this feat has only been done twice: at least 29 points, 9 assists, and 60% TS%. Both by James Harden! Historic scoring, play making, and efficiency! Richie_Rich, D-rock, don grahamleone and 3 others like this.